It all began a year and a half ago, with a quarrel over a bowl of water. A group of women farm workers were suffering in the heat near a village in Pakistan's Punjab province. Aasia Noreen, an illiterate 45-year-old mother of five, offered them water, but was rebuffed. Noreen was a Christian, they said, and therefore her water was unclean  sadly, a common taunt hurled at Pakistan's beleaguered Christians. But rather than swallowing the indignity, she mounted a stout defense of her faith. Word of the exchange swiftly filtered through the village of Ittan Wali, in Sheikhupura district. The local mullah took to his mosque's loudspeakers, exhorting his followers to take action against Noreen. In a depressingly familiar pattern, her defense of her faith was twisted into an accusation of blasphemy, according to her family and legal observers familiar with the case. As a frenzied mob pursued her, the police intervened, taking her into custody. But far from protecting her, they arrested and charged Noreen with insulting Islam and its prophet. And on Nov. 8, after enduring 18 months in prison, she was sentenced to death by a district court, making her the first woman to suffer that fate. 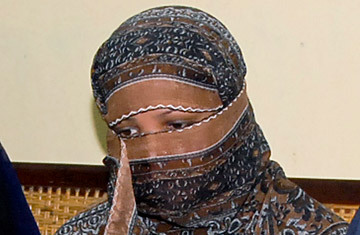 In the ensuing weeks, the case of Noreen, popularly known as Aasia Bibi, has sparked a national furor. Human rights campaigners and lawyers have denounced the sentence. Religious fundamentalist groups, usually at odds with one another, have suddenly coalesced around a campaign to defend the blasphemy law and attack its critics. One politician who called for Noreen to be pardoned now faces a fatwa for alleged apostasy. Another politician, who is trying to have the blasphemy laws amended, has been warned that she will be besieged. On television, religious scholars have disagreed among themselves over the law's merits. Divisions are also being seen within the government, with powerful figures taking opposing sides. And there has even been global outrage, with Pope Benedict XVI last week calling for Noreen's freedom. Noreen's case has spurred the first genuine debate over some of Pakistan's most controversial laws. The original blasphemy law was drawn up by the British, in the Indian Penal Code of 1860, aimed at keeping the peace among the subcontinent's sometimes fractious diversity of faiths. Not only did Pakistan inherit the laws after partition, but it added to them. In the 1980s, General Muhammad Zia-ul-Haq's military dictatorship introduced a slew of elastically worded clauses, including a death sentence for those deemed to have defiled the sacred name of the Prophet. Before Zia, there were only two reported cases of blasphemy. Since the death sentence was inserted in 1986, the number has soared to 962  including 340 members of the Ahmadi Muslim sect, 119 Christians, and 14 Hindus. Close examination of the cases reveals the laws often being invoked to settle personal vendettas, or used by Islamist extremists as cover to persecute religious minorities. Vague wording allows the blasphemy laws to be used an instrument of political and social coercion, says Ali Dayan Hasan, senior South Asia researcher at Human Rights Watch. And they give the state a sectarian character. No conclusive evidence has been presented against Noreen, say people familiar with the case. The district judge relied on the testimonies of three other women, all of whom bore animus toward her. Noreen had long been under pressure by fellow farm workers to convert to Islam, her family says. And the district judge ruled out any possibility of her innocence or mitigating circumstances. Christians are subject to vicious prejudice in Pakistan, where their beliefs are said to make them "unclean." Municipalities routinely advertise jobs for cleaners with a note saying they would prefer Christian applicants. And defending their rights is not popular. When Salman Taseer, the governor of Punjab, visited Noreen in prison and urged her release, he was branded an apostate by fundamentalist groups. And in the fundamentalist view, apostasy, like blasphemy, is punishable by death. Liberal lawmaker Sherry Rehman who has called for amendment of the blasphemy laws and removal of the death sentence clause was warned this week that she would be "besieged." It is a measure of the state's impotence in the face of extremist groups that such high-profile public figures can be openly threatened for merely advocating human rights, says Hasan, of Human Rights Watch. Rehman insists that she won't be cowed by the threats. "I really can't be coerced into silencing myself like this," she tells TIME. "It's my freedom as a legislator to do as I do. If they want to talk, there's no issue. But to use coercion is unacceptable." Taseer, a notably outspoken politician, is phlegmatic. "It doesnt bother me," he tells TIME. "Who the hell are these illiterare maulvis to decide to whether I'm a Muslim or not?" Rehman's reform effort is unlikely to succeed, because few politicians have dared to support it. Indeed, Babar Awan, the Law Minister has vowed to oppose any move against the blasphemy laws. What's more, the Prime Minister Yousaf Raza Gilani, who had last year suggested the laws should be reviewed after the killing of nine Christians in Punjab, now seems to be distancing himself. "It is not our party policy," he told a news channel this week, when asked about Rehman's bill. But Rehman, who spent years fighting laws that discriminate against women, says its mere submission is an important first step: "The first stone has been cast. It's not a taboo subject anymore to be taken up by legislators." More worrying is the fate of Noreen. The Lahore High Court has taken the controversial step of saying that it won't allow President Asif Ali Zardari to issue a pardon, a move that legal experts have said is unconstitutional. Her family is now hoping that the higher courts will strike down the death sentence, or that she will eventually secure a pardon. And the fear doesn't end there. While no one has been executed for blasphemy yet, 32 people  including two judges  have been slain by vigilantes. At Friday prayers this week, Yousef Qureshi, a hardline cleric from the Mohabat Khan mosque in Peshawar, offered a reward of 500,000 rupees ($5,800) to "those who kill Aasia Bibi." Even if pardoned, Rehman notes grimply, Noreen will no longer be able to to live in her community. For her own safety, she will have to be moved  simply for defending her right to choose her own faith.